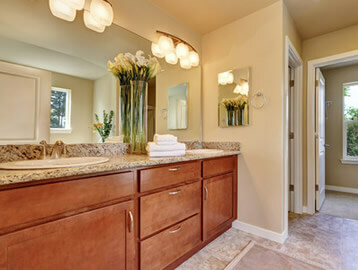 Bring style to your bathroom with Granite Countertops from Extreme Granite and Marble. You’ll be proud and excited to show your new bathroom countertops from Extreme Granite to your friends and family. Allowing Extreme Granite to supply, fabricate and install your new bathroom countertop(s) means that you will enjoy a professionally fabricated counter top that you cannot get anywhere else. You will work with a company that takes pride in each and every job. So, don’t wait any longer to stop in and browse an extensive collection of granite. You will find the unique slab that’s right for your home or business bathroom, have it fabricated, and installed quickly and professionally. Your satisfaction is our guarantee and you’ll soon become a return customer. Whatever it is you need, we’ll deliver. Special requests are welcome, and you’ll enjoy a seamless process from start to finish. You may have an idea in mind, “I have a small bathroom, but I want the best countertop I can purchase for it.” If that’s the idea, then granite from Extreme Granite is the right choice for your bathroom. Your new home has a large and luxurious bath in it, with a long counter and double sinks that you want changed and customized. You want to see large stone pedestal sinks and a full length countertop surrounding them. 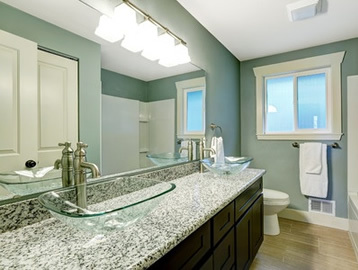 Your business’ bathrooms are due for a huge makeover and you already know that granite is great for public restrooms. Well, at Extreme Granite we can handle all of your bathroom countertop needs and we can even help with the design. From simple vanity sinks to detailed mosaics, we do it all! And our design services will make the process easier because you’ll be working with a group of designers that know how to make a space grab your attention. Let us make your dreams a reality! 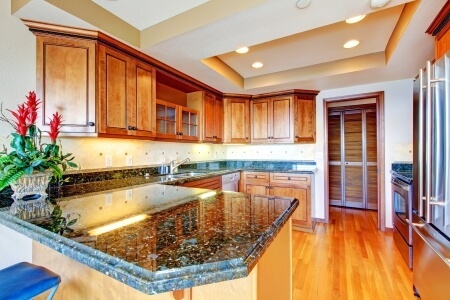 First and foremost granite adds value to your home or business when it comes to resell. 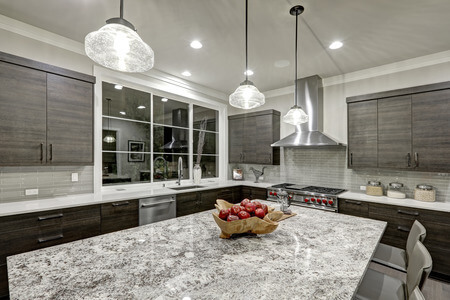 Granite isn’t a trend it is a timeless stone. It is aesthetically beautiful and remains that way for years. It has the advantage of being bacteria-resistant which is an added bonus, especially in public bathrooms. 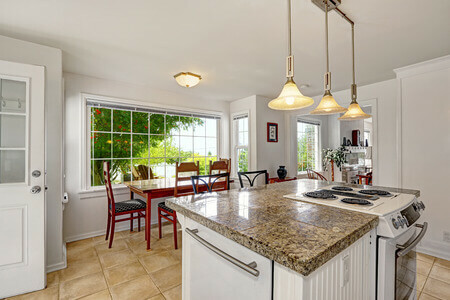 Studies showed that granite ranked firstin cleanability. After washing and rinsing, the granite tops provided the greatest reduction in bacteria counts of all the countertop materials tested. It is nearly impossible to scratch. Granite is available in tiles or slabs, making it versatile enough for smaller spaces and abundant enough for large bathrooms and upscale homes. Granite can be cut into any design orpattern, round or square. 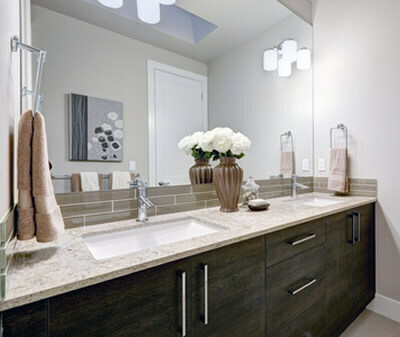 Call us and get a free in-home estimate on your new bathroom countertops. When you visit our show room that is located in Troy, Michigan, you’ll be amazed and pleased at what we offer to provide the best and most beautiful bathroom countertop solution for you. 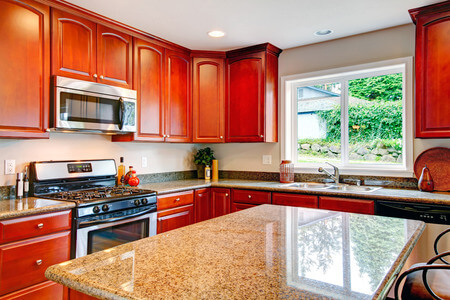 And because we are in Troy, homeowners and businesses in surrounding cities like Rochester and Clarkston can take advantage of all that Extreme Granite has to offer when looking for granite, fabrication and installation. We know stone products best, and our aim is your satisfaction. You’ll be excited to show your new project off to friends and family after Extreme Granite has completed the job.